If “language is communal” with the primary obligation of telling the truth, than poetry — the highest form of literature — is essential for addressing the fragmentation of communities and people. Thirteen years ago, my wife and I hosted friends at our cottage on the outskirts of Asheville. A simple meal of salad, chicken and pasta, and red wine provided the vehicle for conversation and stories. The husband told a story about being pulled over by local police near Old Fort. The officer asked for the husband’s driver’s license and registration. The requested items were provided through a narrow slit of a rolled down window. “I still have to roll the window down,” he smiled. This attested to his mountain frugality and blue collar virtue. The officer returned the license and registration and asked if he knew why he had been pulled over and if he had firearms. “No. And yes,” he replied. The officer asked where the firearms were located. He told the officer that the guns and ammo were stored separately in the trunk. He was then asked to get out of the vehicle and show the officer the guns. Which he did. The trunk was opened to reveal a chainsaw, climbing equipment, tools and containers for guns and ammo. The officer admired the make and model of one pistol. Asked what he did for a living. And requested to handle the pistol. The husband complied. The officer inspected the pistol. To the husband’s surprise, the officer commented that he would tell his wife about this. She might buy it for him as a birthday gift. I admired the husband’s story. His stories were like climbing a mountain road that rose and fell and wove between cove and valley and eventually arrived were it intended. That night, as the dishes were cleared from the dining table and a second glass of wine poured, his wife shared that she and her mother planned to attend my reading at Malaprop’s Bookstore and Café on Thursday night. She confessed that she was looking forward to the scheduled night of poetry and music. But she wanted to know why I chose to read and write poetry. “Why not stories?” she asked. The English word for poetry comes from an ancient Greek word meaning “to make” or “to craft.” The German word for poetry comes from a Latin word meaning “to dictate.” The Romans often borrowed Greek ideas and themes and aped or improved them. Between the two etymologies I gather the impression that poets are conduits for The Muses — the source of inspiration and creativity. Poets dictate the message of The Muses. Poets craft the message of truth. The ancient Greeks invoked The Muses at the beginning of poems, hymns and epics. 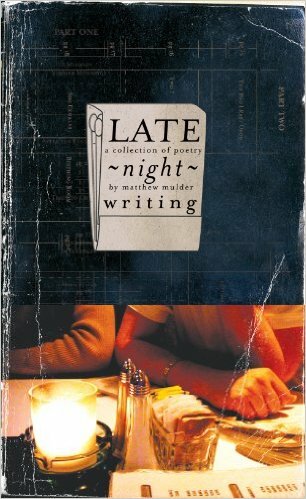 At the time of the diner with friends, I held a casual understanding that poetry in the German language encompasses a compression or density of thought and theme. And that poetry in English embraces beauty and harmony–or graceful elegance. Then, as much as I could afford, I studied Persian, Chinese, Japanese and Korean poetry. And I learned there is much I did not know about continent of poetry. “Why not stories?” she asked. Stories are important. Poetry is essential. Community is vital. Words must nurture a fractured community in order to bring it together and make it stronger. That August Asheville evening, more than a decade ago, was one of the last nights our two families enjoyed supper and stories together. People leave. Find a better job. A greener pasture. Or at least a different job with a different view. Change is the only constant. The transience of American culture enables people to move every few years. Words, idioms and phrases fall in and out of fashion. How then are we to nurture a strong community? Maybe it requires each of us to dwell deeply and stand by language. Stand by words. At least eight years ago, an old beat up manual typewriter provided a platform to compose poetry and other writings.1 It was an effort to return to an intentional practice of crafting poetry and prose without distraction of disruptive media. For years and years, a notebook, journal or sketchbook was never far from reach. But one night after a long night of poetry and music at Beanstreets followed by an even longer time of coffee and conversation at Old Europe, a friend convinced me to try blogging. The immediate response to blogging was infections.2 Connecting with people all over the country, sharing writing samples or books read and being part of an active digital community was exciting. And the feedback on written work was quick — sometimes within a couple days or hours. The practice of writing allowed me to hone the craft of creative writing and exposed me to other writers across the country. One of those bloggers actually showed up at a poetry gig I did. She was on a cross-country trip to visit friends and wanted to visit in real life. Over time, I noticed that my practice of writing notes, daily sketches and other activities had all but disappeared. Relying on keyboards, display screens, hard drives and servers presented became a crutch. My writing drafts and sketches appeared deceptively crisp and final in neatly formatted text documents and web blog interface windows. So, I pulled the plug. Returned to handwriting and typing as practice.3 Some friends and fellow poets saw a few samples of typewritten work and suggested I post it on my blog. It was a novelty. A curiosity. So, I did. I do not claim to be the first person to post an image of a poem typed on a manual typewriter. But I noticed a trend in that direction about a year after posting those images of typed poem sketches.7 Not sure exactly if I started the trend. Probably not. Maybe other like-minded individuals who sought to return an organic practice of handwriting and typing as a mode of composing their visions and ideas. Keep your stick on the ice and remember to use the lowercase L key when typing the numeral one. In truth, I composed poems on an electric typewriter prior to that. Did it for decades. Did not own a personal computer until… well, that is another story. That was when there were a mere couple million web blogs in the world. Now, there are some platforms, like Tumblr, boasting 100 million blogs. The blogosphere has become quite congested. Examples of some the 30 poems in 30 days journal posts with photos: here, here and here. April 1, 2011, blog post. 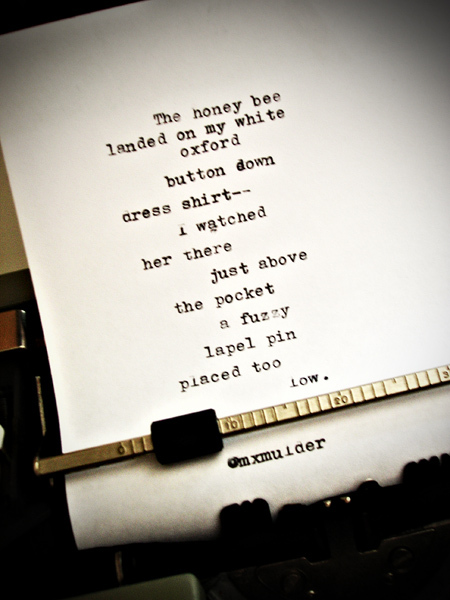 Examples include Typewriter Poetry (though it seems the web site has not been active since March 19, 2015), Remington Typewriter Poetry (this site too has become inactive with the last entry posted June 2016), and the most popular is Tyler Knott (though his web page has an archive going back to 2003 (which is odd because he uses Tumblr as a platform and Tumblr was launched in early 2007… maybe he migrated his content from some other source to Tumblr… but I digress) the posted images do not begin until 2012 (unless I am mistaken). National Poetry Month is nearly at an end. One poet, Ann E. Michael, mentioned that she participated in this year’s National Poetry Month “by reading more than by writing.” I agree with that sentiment. Following the thread of these two poets, I have read and reread some poetry books. A few favorite poems are on my repeat playlist. This poem by Akhmatova. Another poem by Han Shan. A couple poems by Li-young Lee from his book The City in Which I love You. A poem by Tu Fu. Indeed. Why do we do it? My reply is to continue the Great Conversation.